NOTE: Your opinion is very important to us. Use tab “Comments” in top of the page to write your comment/review/feedback, if you have any experience with "#1 1000pip Climber System ! 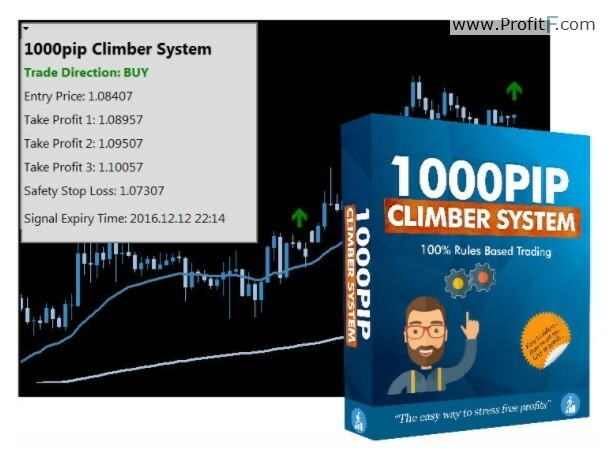 1000pip Climber System is a highly advanced trading algorithm that aims to make it easy for you to become a successful Forex trader. The algorithm closely monitors Forex price movement and tries to identify high probability trading opportunities. This is a 100% rule based trading system and once the software has identified a potential opportunity, it will notify you visually, audibly, and via email. The entry price, stop loss and take profit values are all provided. The system can be followed totally mechanically – just follow the system and get results. Forex pairs – The PCS has been specifically designed for operation on the following currency pairs: EURUSD, EURJPY, AUDUSD, USDCAD, USDJPY, USDCHF. The system is designed to be as easy as possible to set up and use. There is a set up video and a PDF guide explaining how to use the system. If you have any further questions, you can always contact the developer. The 1000pip Climber system really is one of the simplest ways to trade the FX market. During a two and a half year period, Forex system achieved around 1,400 pips per month when trading on the three time frames and six Forex pairs. The signals aim to be as accurate as possible and drawdowns kept to a minimum. Signals are produced on the 15 minute, 1 hour and 4 hour time frames, which means that the system can easily be used by short and long term traders. The 1000pip Climber System should allow you to trade with confidence because you can follow the system completely mechanically. There is no guess work involved. The system will clearly display all the details you need in a signal; entry price, stop loss and take profit. Everything is easy to follow. The developer uses the system themselves and whenever a signal is produced they enter a trade. The system is designed to do all the analysis for you. All you need to do is follow the system. You do not need to be sat at the computer all day to follow the system. When there is a signal the system will create a visual, audio and email notification, so even if you are away from your computer you can still follow the signals. The system will instantly email all the signal details straight to you. Many traders follow the signals from their smart phone and use a trading app. The signals produced by the system are for pending orders (explained in the PDF guide). This means that there is usually no urgency to enter trades. The system tries to make trading as uncomplicated and stress free as possible. Along with the system, you will receive a video explaining how to set up the system and a PDF guide explaining how Forex trading works and how you can follow the system. Everything is made as simple as possible and you can always get personal help if needed. The 1000pip Climber system aims to provide an easy route to stress free Forex trading. The system will automatically look for high probability opportunities, and then alert you visually, audibly and by email. The entry price, stop loss and take profit values are all provided. The system has reliably targeted over 1000+ pips per month for over two years and most importantly, the developer provides full support with their system and can help you all the way.